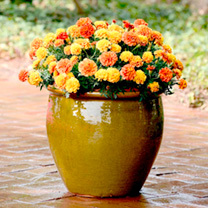 A sturdy variety with excellent weather tolerance, ensuring a long season of colour. The vigorous, free-flowering plants are ideal for borders, with blooms that open out into a fabulous array of apricot-pink petals. A 'must-have' changing colour from minimal to maximum contrast! Height 25cm (10”).